It was nice for my morning Adventure today, but it looks like our blue skies are heading off to visit Tom in France. Send them back soon Tom! In other news, you haven't seen the new cookies that my Aunt Sharon picked out for me. Aunt Sharon rules by the way. No, you can't have her, she's MY Auntie. These are called Mailman Fingers. No actual mailmen were harmed in the making of these fingers. They're so good, Mom's camera isn't powerful enough to catch an unblurry image! Mom and Dad brought in big boxes into the house yesterday. I think my weekend is going to be full of snoopervising again. That's ok, I'm a good snoopervisor. Hope everyone has a great weekend! This is not me, well, that's my nose off to the left. This is Ninja, a Shiba Inu I happened to meet on my Adventure last night. We didn't get along. It might be a cultural thing, he's Japanese, I'm Chinese, you know how it goes. He went off on his own thing and I went off to meet the new Neighbours that moved in late last week. Hi! Welcome to the neighbourhood! Dad brought you a welcome to the neighbourhood treat. Yeah, you can have my share, I don't like those carrot things unless you bake them into cookies. Sorry guys, that's my news. Mom says we'll be having more Adventures today. She'd better bring the camera. That's Dad and I from Saturday, we both needed cuddles. I don't often sit on the sofa, unless there is someone there to cuddle me. It's a good cuddle location. Anyway, I had a busy day yesterday, I had to take Dad to work, help Mom with putting stuff away and snoopervising everything else she was doing, then we had a nap, then I let her know that the mailman was here because she didn't hear the doorbell, then we had to go to PetSmart to show then that I've updated my Bordatella for them, then we rescued Daddy! PHEW! Busy day. We all had supper and then we had to go and visit the neighbours and bring them carrots! It's no wonder I was exhaustipeited yesterday! Today, I'm on snoopervisory duty again. Dad took the car so I don't have to take him to work or pick him up. Darn it. Anyway, I'd better go and motivate Mom to get her work started. The sooner we finish, the sooner we can nap! Mom says I'm allowed to tell this now. In case you don't read her blog, I'm going to be a Big Brother! Mom and Dad are having a puppy. I've known for a while - Mom smells different - but I wasn't allowed to tell yet. Anyway, this past weekend was SUPER BUSY. Grandma and Grandad and Granny and Bionic Grandpa and Great Granny were all around and they all brought bags and boxes for the new puppy - who isn't even here yet! Aunt Sharon and Uncle Marty! They're the best! I even brought my turtle up onto the bed with me last night, in case I needed a midnight squeek, you know. Pei laughter. So, anyone who has advice on how to be a Big Brofur, please send it my way. I'll keep you updated on puppy's progress. Right now, I need a squeek. Where's my turtle? WOW! We had a HUGE storm roll in last night. I woke up to make sure my people were alright. We were all cuddled up together so I went Phew! and settled back to sleep. Mommy got up later and went online and heard that a Tornado had passed through the town where Grandma and Grandad live. I hope they're ok! I hope it doesn't ruin their trip to come and see ME. And my Auntie Jo and I: I think they're both such beautiful women, they need lots of kisses. Mom says today will be a busy day for me. It's a little early for me to be up - so maybe I'll go and catch a little nap so I have energy for the BIG STUFF - whatever it happens to be today. Pei-Ess - Head on over to my friend Tom's Blog. It's his Birthday! I missed posting yesterday! I blame Mom. She had me so busy taking care of her that when it came time to nap, that's all I wanted to do. Of course, I napped with Mom, so, you know, that's important. She did take pictures of me yesterday, they're still in the camera. Sigh. I had another surprise yesterday though! Auntie Brenda came over! So did my Auntie Jo! We used to go to Auntie Jo's house for the Pumpkin Massacre up until last year where it was at Auntie Brenda's. It's nice that they share. 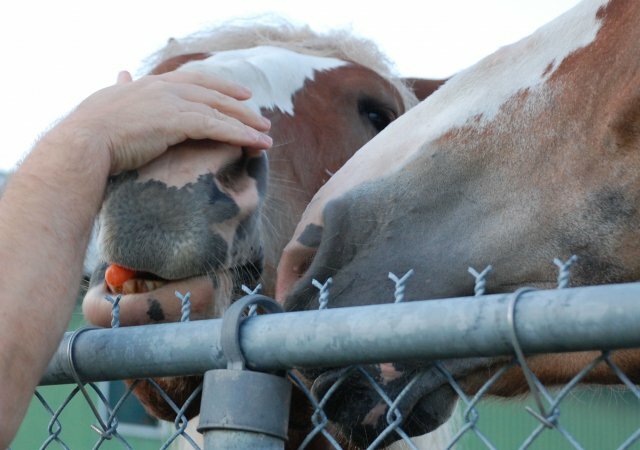 Anyway, I made sure to give them both kisses. More surprises, Mom said I'm going to Day Care today! WOHOO! I'd better make sure she packs my food and the laptop! Pei-Ess, Noah's sister Tess had some surgery yesterday, pop by and send her some healing vibes. I know what one of the surprises this week is! My Grandpawrents are coming to visit me again! I got an email from my Grandad yesterday saying that he had made a special trip to Miss Lea's Poochini's Barkery for Honey Bones! He also said that he'd be seeing me soon and that I was supposed to save some Secrets of the Universe for him! I'm so excited I'm wiggling! For those not in the know, this is me giving Grandad some Secrets of the Universe, aka Snuffles. My Grandad is PAWSOME! Drive carefully Grandad! I'm going to save up my Secrets of the Universe until I see you! A quiet weekend here with a few Noseventures and lots of cuddling. My new friend A/C has been going non-stop but that doesn't stop me from looking out my window and telling off all the cats and animals running around my backyard! Mom says this week is going to be busy, but she won't tell me why. I haven't heard her call for Day Camp for me yet, so it can't be that can it? Every time I ask she just smiles and says Wait and See. Sigh. 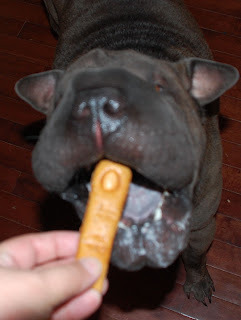 Oh, my bud Hero Shar Pei gave me an award last week and I forgot to acknowledge it. I'm working on my 7 beauty secrets. I just need Mom to focus a bit on me and take out her camera. She's been slacking off again. Sigh. I chased it right down a hole! She didn't let me go after it though. Sigh. Better than nothing I guess. It's beautiful, hot and sunny and we haven't had rain in almost a whole week. And Mom is starting to get mean. Yeah sure, I still get my Noseventure in the morning and my cuddles and she started reading stories to me before she leaves for work. But she won't let me chase squirrels! She says it's because she can't run right now. I don't think that's a good enough excuse. I'd say she can always let go of the leash, but that's against the rules. Sigh. The best I could do today was bark at them (squirrels) from the sidewalk and make whiming noises that Mom and Dad say sound like I'm deflating. Hope everyone has a nice weekend. I'm going to ask Dad to go squirrel chasing with me. He can run. I have the most PAWSOME picture for Wordless Wednesday tomorrow so I had to find one for today you may not have seen for today. I'm chewing on something. Probably a really good cookie. Actually, must be a good cookie, my eyes are closed to savour the intricate mixture of flavours. We lost another Dog Blogger. If you haven't yet, please check out The Painter Pack and send them some thoughts to get them through this. There have been too many DWB losses lately. Sigh. That's all I have to say, except that I'm going to be snickering about my post for tomorrow all day! In between naps anyway. Well, it's been a pretty uneventful weekend for me. I did get to rescue Daddy on Friday though! Then he took my squirrel hunting! What a PAWSOME DAD! We had to go home eventually though. Sigh. Saturday was pretty boring, Sunday I had to help Daddy with a nap. OH! And last night, I slept in a Bolo Cuddle Sandwich! It doesn't get much better than that you know. Anyway, I'd better go and catch up on everyones' blogs. It's sunny today! It was also sunny yesterday! After all that rain we had, some of us - like MOM - aren't really sure what to do with sunny days besides stand there and soak it in. Which, to tell you honestly, is what I do. Pei laughter! Mom is telling me she'll be home early from work and she hopes to take me to rescue Daddy tonight! YAY! I haven't rescued Daddy in a LOOOOOOONNNNNGGGGGG time. He needs rescuing every now and then you know. I hope she brings the camera. I'll need proof to show you on my Monday Morning Report! She also mentioned that I'm going to have to go to the V-E-T to get a Bordatella shot if I want to keep going to Day Care. Uhm, ok, I may be able to handle that, it's for the Ladies at the Hotel right? I wouldn't want to deprive them of cuddling me would I? Will there be cookies involved? It's not a tonight thing is it? I need to pysch myself up for this. That's about all the excitement going on at our house. Mom has a sick sense of humour. I'm not that thankful. 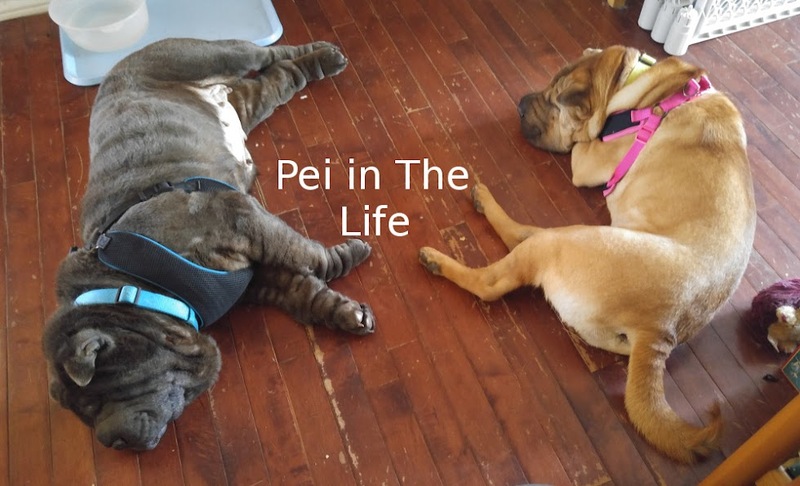 Yesterday was the day in a pei's life that he hates. Where he is forecibly ripped away from everything he holds dear, like his corn chip smell, and forced to take....I'm sorry to say it....a B-A-T-H.
Picture follows, viewer discretion is advised. I'll try and distract myself from this soap smell I'm now covered in by answering some question from yesterday's comments. 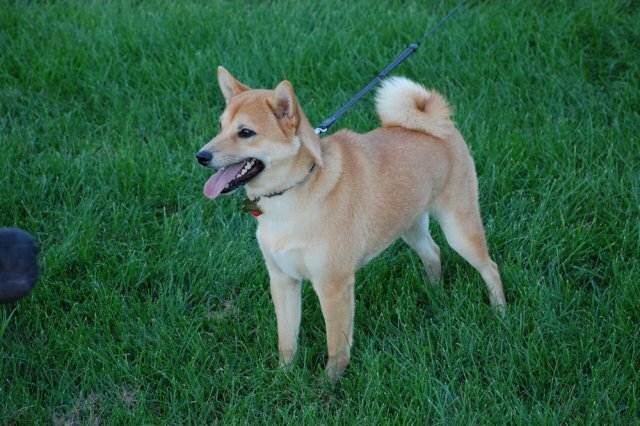 My predecessor, Shih Kwan, was male, and was apparently considered a Red Fawn colour. As for my Nosevember Project, take a peek here at my Nose Expose from last year. I'm thinking of doing something similar again this year. Now excuse me, I have to find SOMETHING to get this soap stink off me. There wasn't a good picture of me to post so I thought I'd post one of my predecessor, Shih Kwan. I realized when I was teaching my Snoopervision Class that I didn't talk at all about attitude. Snoopervisory attitdue is VERY important. It's a lot like guarding someone from something, which I know a lot of us have practice doing. This is my "I'm working here!" face - I was guarding Daddy's nap time. Luckily it was just Mom taking a picture, because I can be fierce when I need to be you know. In other news, I'm starting to think about my Nosevember Project. Planning it out and stuff. So feel free to leave a few ideas about it if you want. It's a Holiday Monday here at my house, I can handle that! Both my people are home! That means a lot more cuddles than if they weren't here at all! It's been a busy weekend. 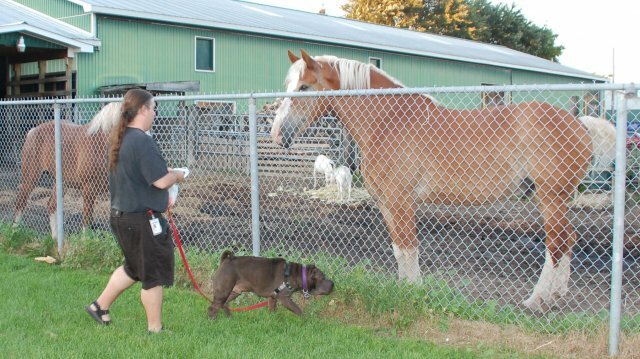 I'm sure everyone has heard by now about the crossing of one of the founding DWB dogs, Charlie - The Big Dog. I wasn't a follower of his blog, but it's still sad. Snoopervising Daddy's nap. Yup, he's sleeping. I also had to snoopervise some naps for Mom. Dad doesn't play with the camera so there are no picture of me snoopervising Mom's nap. Mom says that's ok. There have also been a few noseventures so it hasn't been all naps and cuddles you know. Hope everyone has a great day, I have to re-energize so I can snoopervise the Family Nap later today.